Based on the trusted Fluke 87 DMM, the 787 adds the ability to measure, source, and simulate dc loop current with 0.05% accuracy and 1 µA resolution. DMM and Loop Calibrator in one tool. 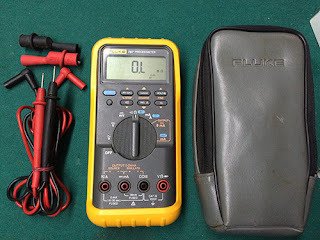 Precision 1000V, 440 mA True RMS Digital Multimeter. DC current source and Loop Calibrator. Min/Max / Average / Hold / Relative Modes. Manual Step plus Auto Step and Auto Ramp. Simultaneous mA and % of scale read-out. Frequency measurement to 20 kHz. 1000V overload protection on V, ohms, frequency. Batteries: Single 9V Alkaline battery. Dimensions: 32 x 87 x 187mm . Included Accessories:C81Y yellow meter holster, TL75 hard point test lead set, AC72 alligator clips, battery & Fluke 787 user manual.